Welcome to Temple Beth Or! Our warm, compassionate, vibrant, spirited, inclusive, and participatory Reform Jewish community is religiously and geographically diverse, serving Washington’s northern Puget Sound. Browse our Web site, attend a service or event, and join us! Bringing Temple Beth Or members, friends, and family together through meals, learning, and experiences, and at the same time raise funds for TBO! Experience a real Steam Boat—the Amity—and cruise on Lake Stevens while enjoying a top-notch brunch. Three-Two-One Blast off! Learn to fly model rockets and watch them soar through the sky! Perfect for ages 6 to 12—take your own rocket home for future flights. DIY Shofar! Where else could you learn to make your own kosher Shofar? Complete with lessons on how to play it! Elegant Provencal Grand Aioli dinner, tres chic! Twelve people will gather for a unique way to dine in the Pacific Northwest. These programs and many more are ready for your perusal in the catalog coming your way and available at Temple Beth Or. Including yourself in one of these programs will support TBO, provide a unique way to bond with other TBO members and offers a terrific meal, or learning discovery or experience. Click here to view the catalog – click here to register! It was such an honor to formally install Rabbi Rachel Kort at our Friday Night Shabbat Service on February 22. Rabbi David Fine bestowed the installation blessing, and we also installed our 2019 Governing Board and welcomed all of our new members. Read Rabbi Kort’s Installation Sermon here. The ORacle Newsletter is Back! Temple Beth Or members have now been mailed the January, February and March 2019 issues of “The ORacle” newsletter. We stopped publishing this printed newsletter several years ago, but have resurrected it as another way to communicate with our members. Back issues are also available online here. Please contact us to let us know what you think, provide comments, or request to be on the mailing list. If you missed the Temple Beth Or Purimspiel performance, you can watch the first half and the second half online. Join other Next Chapter members as we experience Jeffrey Gibson’s national exhibition at the Seattle Art Museum on April 28 at 2:45 pm. A docent will provide insight into the artist and his work. 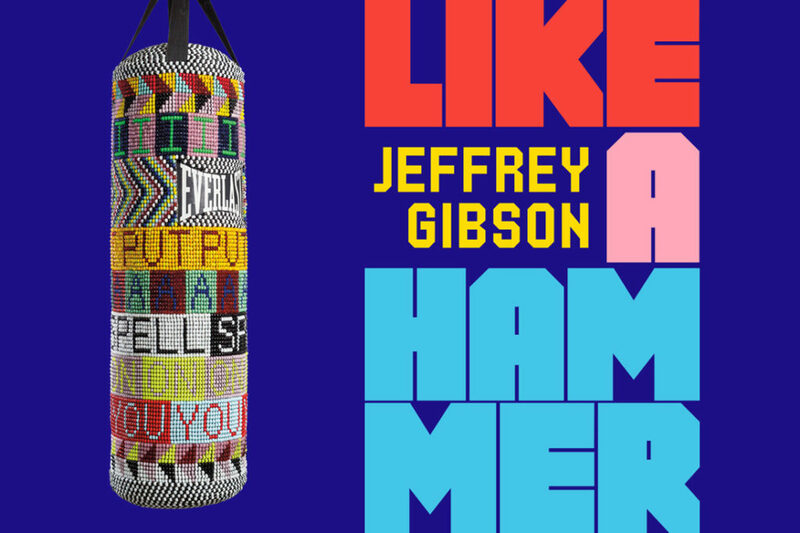 Jeffrey Gibson’s Like a Hammer is a major museum exhibition presenting a significant selection of this contemporary artist’s exuberant artwork created since 2011. If you are a SAM member there is no cost. If you are not a member the admission fee is $21 for adults or $19 for seniors. We need a final headcount by April 20. Please send a check to Temple Beth Or, payable to to Julie Mackoff. If you are a SAM member, please send your name and membership number (on the back of your card) to Julie. An early dinner will follow at Chiang’s Gourmet, 7845 Lake City Way NE. More details about the dinner to follow. Carpooling information will be provided at a later date. If you have any questions, please contact Julie Mackoff. Time to Register for Summer Camp! Even though snow covers the Cascades, it is not too early to enroll in Summer Camp. Camp Kalsman, located in Arlington, is the URJ’s newest camp, and commonly fills by the end of March. Check it out, as well as many other exciting Jewish summertime opportunities. Temple Beth Or has a limited amount of ‘Campership’ funds to help families afford camp. The deadline for applying for these funds is February 28. Did you know that Temple Beth Or and the Union for Reform Judaism are now offering an email subscription to ‘Ten Minutes of Torah‘? 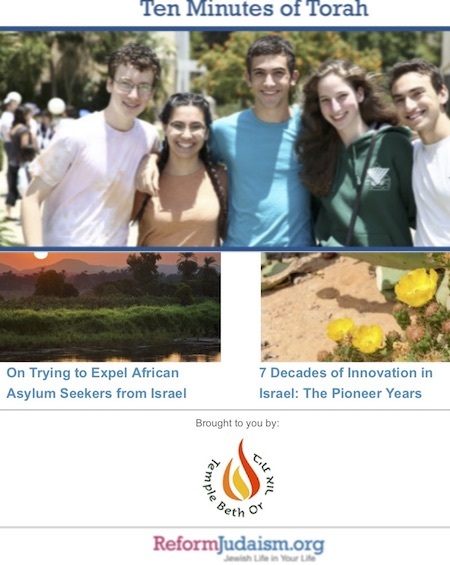 The ‘Ten Minutes of Torah‘ page lists the most recent short and pithy email posts on ‘Reform Voices of Torah’, ‘Celebrating Jewish Arts & Culture’, ‘Pursuing Social Justice’, ‘Israel Connections’, ‘Reform Life, Jewish Life’, and ‘The Rhythm of Jewish Time’. From there, select, “Sign up for Ten Minutes of Torah“, where you can subscribe to each of these newsletters, which will then be delivered weekly to your email mailbox. Don’t forget to indicate that you are a member of Temple Beth Or, to receive the co-branded TBO/URJ versions of these newsletters. Check out our new Volunteer Forum! Check our our new Volunteer Forum, where you can recognize Temple Beth Or volunteers, and view current volunteer opportunities. Right now, we are featuring our recently-retired Calendar Coordinators, and looking for volunteer(s) to post events on our online calendars.